In the first round, we had more than 43,000 total votes cast and one of the games played (Georgia and Vanderbilt played at Vanderbilt’s gym while in town for the SEC Tournament). We’re off to a great start! Second round voting runs through Saturday night. We are hoping to know soon on the plans to play the semifinals and championship in Houston. Funding models are still welcome! After first debuting KPI Rankings for Manager Games in early January, @B1GManagerHoops and @KPISports have teamed together to establish the first-ever Manager Games Postseason Tournament. To advance through the bracket, teams have two options. Option 1 is to play the game (two 20-minute halves, 2’s and 3’s, clock stops last two minutes, common fouls in last two minutes are 1-and-1). With geography part of the bracketing process and conference tournaments taking place this week, the hope is several games can take place (Georgia and Vanderbilt played their first Round game). Option 2 is determining the winner 50% by expected score of the game at a neutral site (by KPI) and 50% by fan vote. This allows for a team’s performance to be quantified as well as for managers to help generate fan votes for their school and managers. The expected score of the game (and hence 50% of the vote) is listed on the bracket for each matchup. Twitter polls will be used to determine the 50% fan vote and are live now. Voting for the second round will run through Saturday, March 12 at 11:59 p.m. ET. Voting and deadlines for future rounds will be announced as the tournament continues (note the change from the original date posted in February). We continue to pursue options to have the last four remaining teams play for the Manager Games Championship at the NCAA Final Four in Houston. Work continues on a funding model to get the four finalists to Texas in hopes of a future announcement. The assistance provided by several groups, including the NCAA, is much appreciated. In order to be eligible for the 2016 Manager Games Postseason Tournament, teams had to play a minimum of four games and be among the Top 64 teams ranked in KPI by Saturday, March 5. At midnight Saturday night, scores became official. 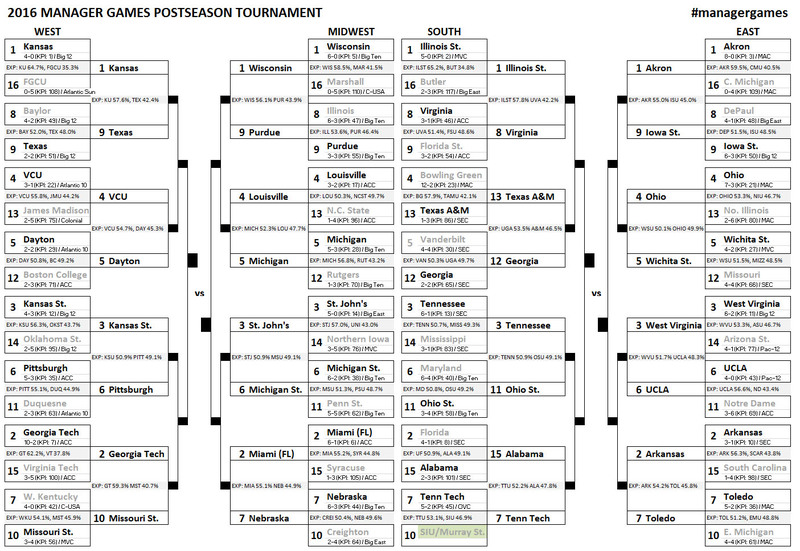 The teams have been bracketed into four regions of 16 teams each using KPI Rankings to determine a 1-64 seed list. NCAA Tournament bracketing principles were used with one exception: conference matchups and geographical rematches were encouraged to increase the chances of playing. 12 teams moved up or down one seed line in the interest of geography. In all, 137 schools from 25 different conferences took part in 275 Manager Games this year. Many thanks to ESPN.com and the New York Times for incredible features on Manager Games. Feedback is always welcome. Thanks to everyone for a great regular season, and good luck in the postseason!